The differences between competences and understanding are explored and their complementarity is emphasised. As part of this, special attention is given to the communication process in education and to understanding as an internal learning outcome; these are illustrated by reference to difficulties faced by physics students who have autism spectrum disorders. 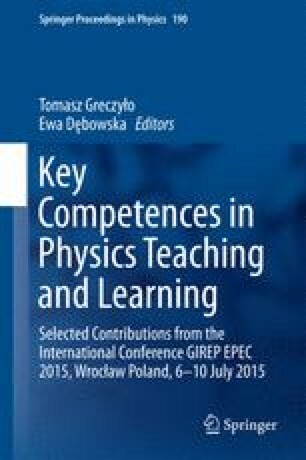 There is discussion of the competences that physics degree course should aim to develop in students with special attention being paid to some basic aspects of communication competence and to the development of personal qualities. Some work done by the EUPEN Network and by the HOPE project is described. The process of degree programme design is described and examples are given of work in (a) developing a package of modules for self-paced flexible learning of mechanics, (b) development of “guided discovery learning” in nuclear physics and (c) Socratic dialogue methods in tutorials. Brief speculations are made concerning some possible implications of applications of artificial intelligence to education. Finally the essence of thinking like a physicist is illustrated by some quotations. Many colleagues at Imperial College in Physics, Neuroscience, Engineering, Mathematics, Computer Science. Many colleagues in the EUPEN network, particularly Luigi Dona dalle Rose (Padova, IT) and Hendrik Ferdinande (Ghent, BE), discussions with whom have had a very beneficial influence on me. Colleagues in TUNING, particularly Robert Wagenaar and Julia Gonzalez. Vanessa Aldis (Coombe Hill Junior School, UK) for extra insight into problems faced by students with Autism Spectrum Disorders. Carlos Uribe (Uni-Valle, Cali, CO) with whom I had stimulating conversations on some of the above topics from a very different perspective. I am very grateful to GIREP for inviting me to give a presentation at the conference.